To better understand how shipping container structures can serve the water treatment industry, members of the Falcon team attended WEFTEC 2017, a conference for water treatment professionals. Brent Mayes, director of technical sales, writes about his experience in this special guest blog. When it came to water treatment, I used to only imagine water and underground pipes. While pipes are still a big part of the industry, WEFTEC fundamentally changed my understanding of water treatment by introducing me to the industry’s high-tech focus. 22,000 visitors—enough people to populate a decent-sized town—flew into Chicago to discuss the latest solutions for cleaning water and updating infrastructure. A lot of the discussion was highly technical, but I could still sense the industry’s excitement as they prepare for a great decade. Most of the United States’ water treatment infrastructure was installed in the 1950s and built to last around 75 years. As 2025 fast approaches, municipalities are starting to pay more attention to the pipes that run in the backdrops of their communities. According to the American Society of Civil Engineers, one million miles of pipes deliver 42 billion gallons of water across the nation every day, and those numbers need to grow. The American Water Works Association estimates that updating and expanding water systems for an increasing population will require $1 trillion in investment. The water treatment industry is rising to the challenge. 1,100 leaders in the water treatment industry exhibited their work to promote a future where high-tech systems deliver and monitor our water. It was kind of like an aquatic Disney World: you could visit everything in one day, but you’d be rushing through. Falcon’s CEO, Stephen Shang, noted that his step counter recorded 5,001 steps in two hours—that’s two and half miles just touring the exhibit hall for the morning. Some of the live demonstrations featured equipment large enough to fill a conference room. Exhibitors often added colorful plastic balls to the water so we could see the direction of the flow. I found it surprisingly entertaining to watch the colored balls shoot through the pipes as the equipment filtered these “particles” from the water. We were pleased to see Falcon Structures’ clients such as WesTech at the conference. However, we discovered that shipping containers are not widely considered an option for modular water treatment equipment shelters and enclosures. Most of the smaller treatment units were housed in an 8-foot by 10-foot fiberglass enclosures. I imagine most customers look at a typical 20-foot shipping container and think, “That’s overkill! We wouldn’t use all of that space,” but a 10-foot shipping container equipment shelter is perfect for smaller pieces of equipment. Falcon’s experience working with energy companies to create 10-foot equipment enclosures for pipeline monitoring equipment makes me confident that a similar product for would be a great fit for many original equipment manufacturers. 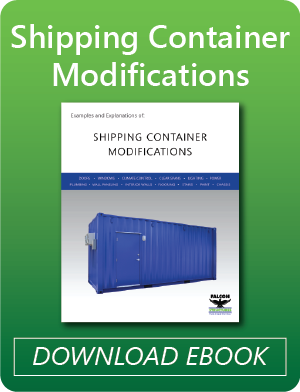 10-foot shipping containers are a great option for water treatment equipment. 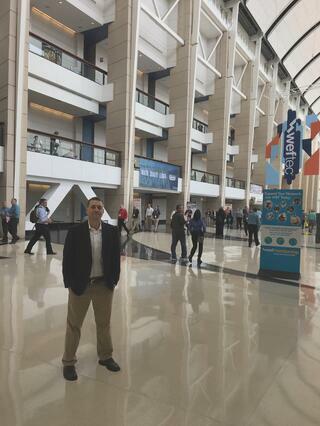 The insights we gained were definitely worth the trip, and it was great to spend time in the friendly atmosphere of water treatment professionals getting excited about the future. I look forward to watching the water treatment industry innovate on a critical utility that we use every day. Have a question about our modular shelters? Contact us or call our expert sales team at 877-704-0177. We’re happy to provide a free, no-obligation quote for your project.